Q. How are you feeling physically and mentally? How do you feel about this tournament? RAFAEL NADAL: Good. Is the first time I am here without playing official match in my career. Is new situation for me. But I feel good. I feel that I had good week and a half of practices. Remain this afternoon and tomorrow, the last practice before the competition start for me. I really hope to be ready. I feel myself more or less playing well. So, yeah. Q. Between the O2 and now, what was the process like? You were in a pretty bad way at the O2. RAFAEL NADAL: Had been a long season. Good one, but at the same time long, without playing a lot of tournaments but playing a lot of matches. Yeah, I had to stop for a while. I started little bit later than what I expected. That's why I was not able to start the year playing in Abu Dhabi and Brisbane. We decided to start later because we needed some more practice, start slow, to be fresher, little bit more fresh mentally and physically, and do things the right way. That's what we tried to do. Here we are to try my best, try to see if I am able to start. Q. Has the intensity of your practice been as tough as you wanted it to be? RAFAEL NADAL: The last week and a half, of course. Q. I noticed yesterday that you seemed to be having kind of a practice match with Dominic under full match conditions, ball kids, scoreboard, umpire, and everything. Can you tell us how that came about, how that was facilitated? Was it your request? RAFAEL NADAL: Well, I wanted to play couple of close competition matches. I played in Kooyong once. Yeah, the club in Kooyong is great, but at the same time the conditions of play are completely different from here. That's my feeling. We decided to play another match. Talking with the Australian Open, yeah, they give us the chance to play like an open practice but closer to the match for the crowd. I have a good relationship with Dominic. I spoke to him about that. He was very happy to make that happen, too. We did it. It was a good practice, good feelings for both of us I think. The job was done the right way. Q. Everybody is talking about you and Roger for winning. Where do you think David Goffin is in his chances of doing well here? RAFAEL NADAL: The same as always: he is one of the best players of the world. If he is fresh, and I believe that he is, he's very complete player. He can fight for everything. He is a big, talented player, yeah. He has experience already playing big matches. And why not? Q. Could you have more motivation for this tournament, given the nail-biting final last year? RAFAEL NADAL: No. Is impossible to be more motivated than last year or any year. For me, Australian Open always, if you are not enough motivated, 100% motivation to play this tournament, probably you don't love this sport. Q. What do you see as the toughest matchup for you in this tournament? RAFAEL NADAL: I don't think about that. I think about first round I play against Estrella Burgos. I go day by day as I always did. Is going to be the first official match of the year. Don't make sense to think farther than that. I am looking to have a good practice this afternoon, good practice tomorrow, and be ready for Monday. That's my goal. And let's see. Important for me is beginning of the tournament this year. Q. How are you feeling without Toni, your first tournament without him as a coach? How are you feeling these days? Yeah, is a change in my career, but let's wait little bit, you know. If I feel strange in a few months, but now is just the beginning. I feel happy with my team. Toni give me a lot during all my career, as I said thousands of times. I don't think is necessary to repeat again and again. Without Toni, I probably won't be here today. That's the real thing. I can't thank him enough for everything. But now he decided to do another thing. He is focused on the academy. He came to some of my practices during December. No, all the natural process, and that's it, no? Happy with all the things he's doing now in the academy. I'm happy with the way that I am working with Carlos, with Francis, with the rest of my team. Let's keep working hard to try to have a good year. Q. Billie Jean King said yesterday if she was still playing, she would refuse to play on Margaret Court Arena because of the many comments Margaret has made against gay people. What is your thought on those comments, and would you understand if some players felt uncomfortable playing in an arena with her name on it? 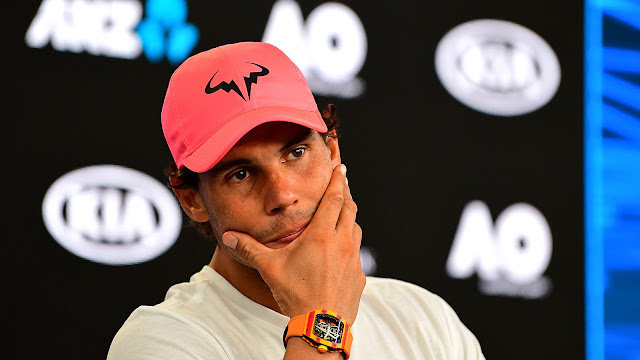 RAFAEL NADAL: I don't have the whole information. Really, I am here to play tennis. I am not here for things that really doesn't have a big impact on the game. I love the Margaret Court Arena. If the Australian Open decides to hold the name or decides to change the name, is not my decision. I am really just here to play in Australian Open. I going to play. If they put me to the Hisense, I play to the Hisense. If they put me to the Rod Laver, I play the Rod Laver. If they put me to the Margaret, doesn't matter the name, I play. Q. Is there any special importance for you that you're starting the year as the No. 1 player, or is that just kind of a fact? Q. Is there any special importance for you that you're starting the year as the No. 1 player? RAFAEL NADAL: Is better to start No. 1 than No. 20. I'm being honest. That's the real thing (smiling). Everyone starts from zero. I start from zero again. Start as new season, an exciting one. I hope to be healthy and competitive, and most important thing, I hope to enjoy tennis one more year. Q. When Toni has come to your practices, does he participate as much as before? Has he given you a bit more space with your team? Q. You said Toni comes to your practices in the off-season. Does he participate as much when he has done? RAFAEL NADAL: He participate as much as he wants to participate. He's my uncle. He's more than anything else. That's it. Everything that he wants to do with me, I am happy with, no? Is not about my decision. He has enough confidence with me, or I have enough confidence with him, to talk about anything I have to talk. From your perspective is different than my perspective. Is difficult to explain. But is part of my family. Is not only coach that he's coming or not coming. I call him like a family. He love me. I love him. Is not about, you know, professional relationship. Is a familial relationship. In terms of professional things, I spoke to him few days ago, speaking about how the life going, how the tennis going. If I have something to ask, I ask to him. If he have something to tell me, he call me and tell me. No, no, is not difficult situation. Is very easy situation. Q. In recent months both Andy Murray and Stan Wawrinka have suffered with their injuries and time out of the game. Stan was in here earlier telling us how hard it had been trying to get back. Andy did something similar when he wrote his Instagram post recently. Now that you're a little older in your career, do you value this more than ever now, when you're preparing for a season? Are you aware it's not going to last forever? 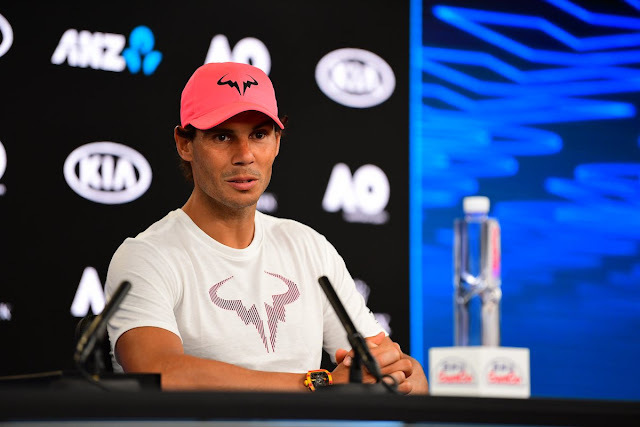 RAFAEL NADAL: I was in the situation that they are probably more times than what they have been, you know. Is nothing new for me that I get injury. I don't know what's going to happen. The problems that they had in different issues, you know, different injuries, but I had these problems during my career couple of times, no? I really since the beginning, because in 2005 I had a very tough foot injury, and I don't know if I will be able to keep playing tennis. During all these years, I was very happy to keep playing tennis, no? I don't need to be 31 to say, Okay, I am lucky to be here. No. With 22, I felt the same. I'm still feeling the same. In general terms, I feel lucky to have the chance to enjoy all the experiences that the tennis give us. I hope to keep enjoying that moments for a while. That's it. I wish Stan and Andy a good recover, all the best for the future, healthy. Another thing is that there is too many injuries on the tour. I am not the one to say, but somebody have to look about what's going on. Q. Changes may be needed? 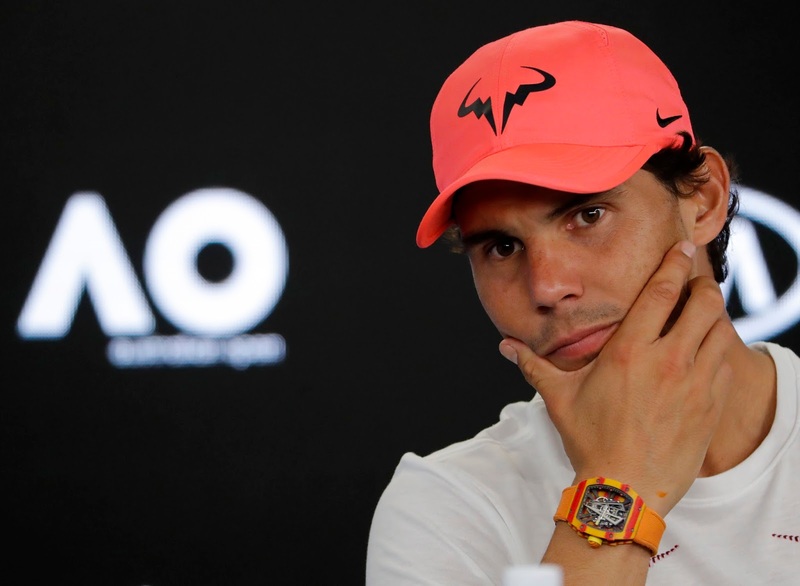 RAFAEL NADAL: I repeat: I am not the one to take decisions. But when something is happening too often, something we are not doing well. Q. Do you think that decisions will be made about this, that the tour and the ITF will look at these things? RAFAEL NADAL: No, no, no. I am not saying what to do. I am just playing tennis. But when something is happening, you need to analyze why.